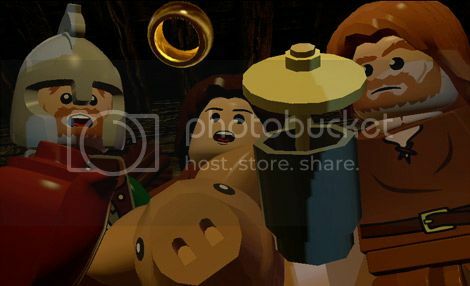 Games receiving the LEGO treatment often have the potential to be a little superficial in their juvenility, but LEGO The Lord of the Rings somehow manages to combine the innocent fun of previous titles with the maturity of the subject matter. When either reading Tolkien’s classic, or watching Peter Jackson’s fantastic adaption, every time I witness the slaying of Boromir at the hands of the nasty Uruk-Hai, a particular sense of emotion swells up in me. He is to many perhaps the least likeable member of the fellowship of the ring, with his often arrogant manner looking quite villainous in comparison to Aragorn’s handsome good looks. But he’s actually very misunderstood, and in his death some interesting things are revealed through his character. His attempted seizure of the ring from Frodo demonstrates the corrupting effect of power, which through his desperate attempt to do good for his people of Gondor, Boromir ultimately loses his sense of moral goodness by abiding to an evil logic of ‘any means necessary’. He is realistically flawed, which all us imperfect humans can connect to, and this is what makes me well up like a confused school girl. However, as I play this important moment in TT Games’ LEGO The Lord of the Rings, I was caught a little off guard. As the Uruk pulls back the string of his bow to deliver the fatal blow to Boromir, I notice that he doesn’t utilise the conventional arrow of the Tolkien material, but instead opts for a live chicken. The chicken clucks away and I make a sound not dissimilar, but is half way between a laugh and a tear. ‘What would Tolkien think of this?’ I wonder. Games receiving the LEGO treatment often have the potential to be a little superficial in their juvenility, but LEGO The Lord of the Rings somehow manages to combine the innocent fun of previous titles with the maturity of the subject matter. This is mostly due to its fabulous recreation of every major scene from the respectful Jackson trilogy: including Legolas’ Oliphaunt trunk sliding and the epic Helm’s Deep sequence, but it also captures the more intimate moments, such as hiding from the Ringwraiths near Bree. It features for the first time in a LEGO game, not only proper voice acting, but dialogue taken from the films themselves; which are used for gags and seriousness. The comedy elements come thick and fast, with Eowyn’s feminist desire to fight for Rohan being milked for all humorous value, and yet, this only emphasises the girl power theme. Likewise, Frodo appears to be relatively untouched, leaving the funnies to Sam and Gollum, but this achieves a great sense of Frodo’s descent into despair. 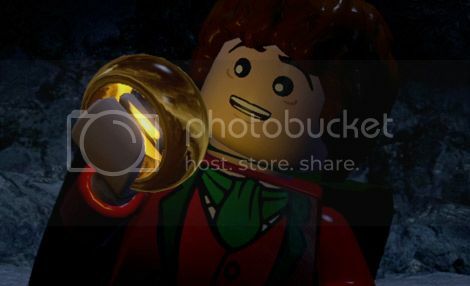 It’s even possible to unlock a ‘weary’ character variant that makes Frodo look like the result of a rough night of ale slurping down The Green Dragon. The general gaming experience is of the typical LEGO format. 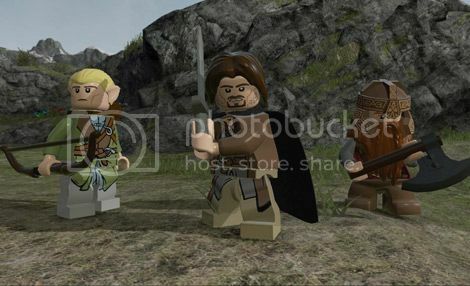 As you follow the story of the three films, the player controls the different characters of the films in order to make the epic trip to Mordor and destroy the ring. Combat is based around a very simple one button attack, but each character does retain a certain individual quality according to the way they move. Where the brains of LEGO LOTR come into play though, is in the differing abilities of the major characters and the way you use them to explore and advance in the environment. Legolas can jump high and shoot arrows, Sam grows plants like a fantasy Titchmarsh, while Gollum can slither up and down walls. It’s nothing too challenging, but there are certain moments in which this combination of different talents create some interesting moments of puzzling. The battle of Osgiliath requires constant swapping between Faramir in the foreground and Frodo behind – demonstrating an impressive use of perception and level depth. A crafting mechanic allows using collected mithril to create new weapons and items – such as the dance floor filling mithril disco phial that features some excellent lyrics from King Theoden. Mini-Kits make a return, as do the usual button bashing treasure hunting, but the most interesting addition to LEGO LOTR is the use of Middle-earth as a world map. While not quite the open world adventure previously promised, it is still nevertheless an absolute joy to explore. The broodiness of Fangorn is convincing in its dark greens, while the epic plains of the Pelennor fields shine and gleam in front of the iconic Minas Tirith. It is absolutely beautiful, and a wonderful representation of the majesty of Tolkien’s world. Once you’ve completed the central story, it’s possible to freely wander Middle-earth discovering secret areas previously inaccessible and solving quests. It also creates a reason to go back through the story again, since after unlocking particular new character and items, you can solve new puzzles in freeplay mode. However, there are a few things the game fails to deliver on. The world map is slightly ground breaking for a LEGO game, but is not simple enough for what is essentially a family game. It's not obvious at first how to fast travel, and setting waypoints prove nothing short of a pain in the arse. They require constant resetting after regularly disappearing and sometimes even if you’re heading in the right direction, manage to lead you the wrong way. The game is also subject to regular freezing, and the initially impressive fade-in/fade-out split screen often makes it incredible difficult to see where you’re going or reach an objective. Regardless, it is difficult to not fall in love with LEGO LOTR. When playing through the game, you get the impression that the developer’s at TT Games just absolutely adore Tolkien. They don’t just capture Jackson’s interpretation well in their successful acting of particular action set pieces, but they respect the attention to detail that the original author put into his life’s work. Swords have the correct names, like Gandalf’s ‘Glamdring’ and even famous character's from the books who don’t appear in the films make an appearance as playable characters. Long term fans of Tolkien will be pleased to hear it is possible to find the enigmatic Tom Bombadil out in the wilderness of the forests, while Radagast the Brown can also be discovered wandering near Bree. Middle-Earth, while condensed, is at its finest adaptation on a console here, in which previously it has only been outdone by The Lord of the Rings Online. It really does give a sense of the depth of Frodo’s journey, particularly because you can literally walk from The Shire to Mordor without any interruption by a pesky loading screen. While it might not be a big enough break from the previous conventions of the LEGO games, the greatest achievement of LEGO LOTR is that it manages to capture the depth of its subject matter in an accessible and hilarious form. It is humorous, colourful and playful, and yet doesn’t sacrifice any of the major themes of Tolkien’s work. If I was a parent, and perhaps one day I might be, I would be pleased and ecstatic to force such a game on my child, because it might just get them excited about The Lord of the Rings and maybe get them thinking about the ideas it encourages. I therefore reckon Tolkien would think ‘well done TT Games, you massive nerds’.